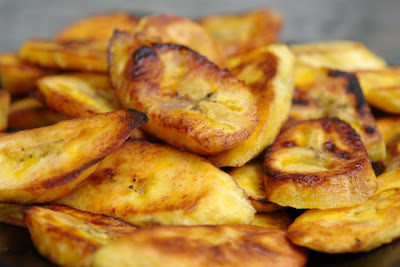 Smashed Caramelized Plantain recipe courtesy Tyler Florence 4 ripe plantains 2 tablespoons extra-virgin olive oil 1/2 stick butter 4 tablespoons packed light brown sugar Pinch salt 1 lime, juiced 1. Cut ends off ripe plantains (soft and blackened), peel and slice in half lengthwise. 2. Set 2 large non-stick saute pans over medium-high heat and add oil and 2 tablespoons butter into each pan. Add plantains and cook for 10 minutes - you don't want to move it too frequently otherwise it won't caramelize as well, flipping halfway. 3. Once you flip the plantains, sprinkly with light brown sugar and salt. 4. 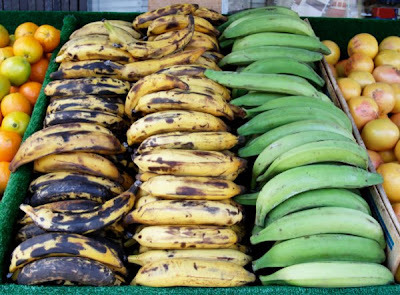 The plantains should be nice and golden. Squeeze with fresh lime juice just before serving.